Hi friends! I hope that you all are doing well. We are doing pretty good. We are enjoying spring here in our neck of the woods. We still have a couple weeks until spring break though. We are however keeping busy. Today, I am sharing a card I made for a call that wasn't picked up (aka REJECT). I've started submitting to magazines again. Well, I really only submitted 3 cards to a holiday card call. Nothing got picked up. I'm not gonna lie, I was hoping that I would get a card picked for the magazine. I know that it's not realistic and that these things take time but I was just hoping. Oh well. After some deliberation, I decided to share some of the cards instead of saving them for feature submissions. This card is made with Doodlebug papers and stickers. I added some shimmery May Arts ribbon and some sequins to be snow. Keep your fingers crossed for me for the next call! I'm having a really hard time finding balance. I want to craft but at the end of the night I'm just so tired. I really thought that I'd have a handle on this whole having three kids thing by now but I'm still feeling like I'm barely mucking through. Have a great day, friends! Don't get discouraged...just try, try and try some more...especially if you're enjoying the process! I know what you mean about being tired at the end of the day. I've lately discovered staying up late catches up with ya after a while! 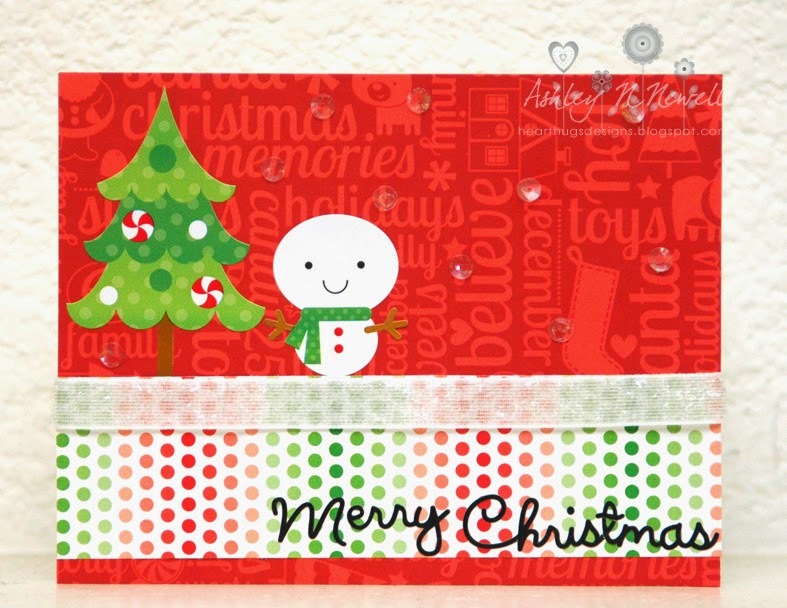 Love your card with all that Doodlebug goodness! Such a cute card Ashley! Finding time to craft with 3 is hard...my little guy is almost two now and I really have to be super motivated to craft at night. For me, crafting at nap time or in the morning when my husband is home works best for me. Kudos to you for getting some projects made for submissions. I keep having good intentions to submit but haven't made it happen this year yet! He is really cute! Hang in there with the calls....I feel like you just need to get back into the rythmn again, and it will come...like riding a bike. Its the snowman! He looks great here!